Our exquisite Christmas tree ribbons add another layer of elegance to any Christmas tree or wreath. 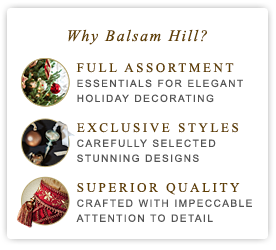 Create the perfect designer look for your Christmas display with these stylish Christmas tree ribbons from Balsam Hill. Beautiful and elegant, our Christmas tree ribbons can instantly add sophistication to any Christmas tree, wreath or garland.